Months ago this darling little desk, which my husband has named Stella, made its way to my garage. It sat there gathering dust for months until I finally got the inspiration I needed for this desk makeover. This month’s edition of #FurnitureRefresh is It’s All In The Details and this was the perfect piece of furniture to get made over. 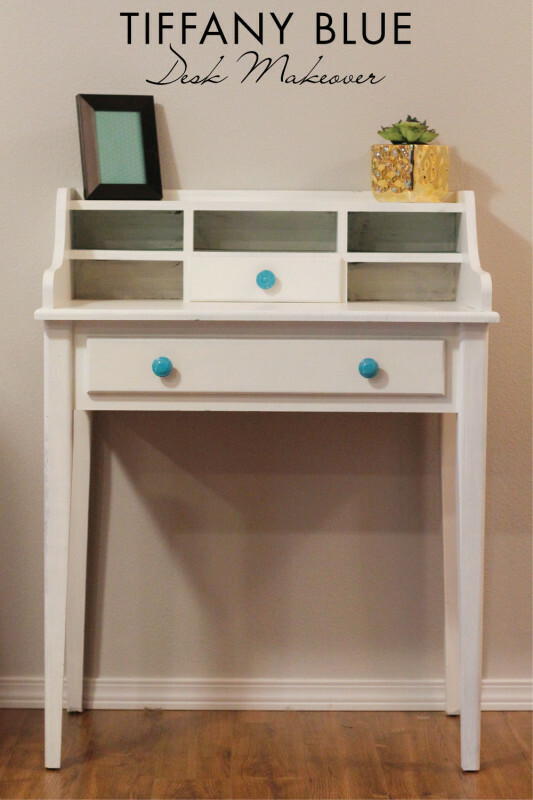 Bre at Brepurposed is super talented and I love all her furniture makeovers. 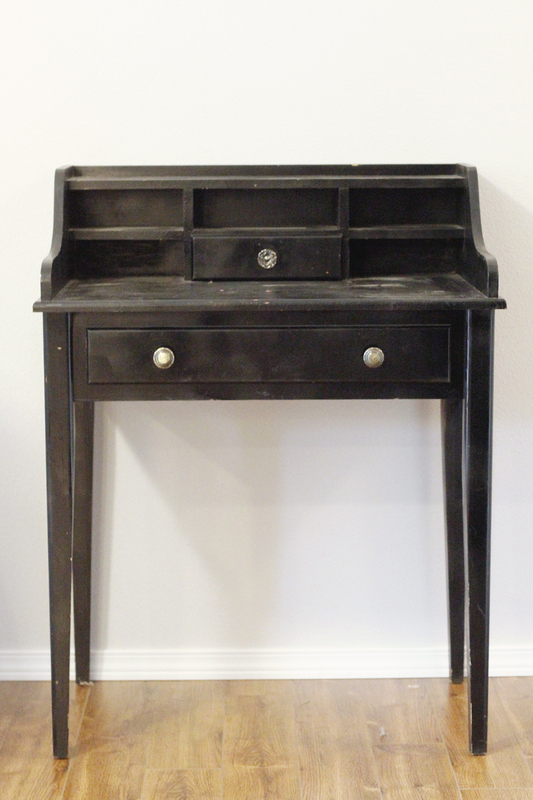 I knew when I saw this little side table makeover that one day I wanted to do something similar. Here’s what my desk looked like before the paint. I started by cleaning this old desk that used to be my little sister’s desk in college. I sanded down some of the rough areas where nail polish had spilled and decided it was time to figure out colors. I told the guy in the paint store I needed to get white. Simple, right? Ya, not so much! Do you know how difficult it is to find the perfect white? I wanted a warm, marshmallow white. I ended up using Designer White from Miller Paint and I love it! 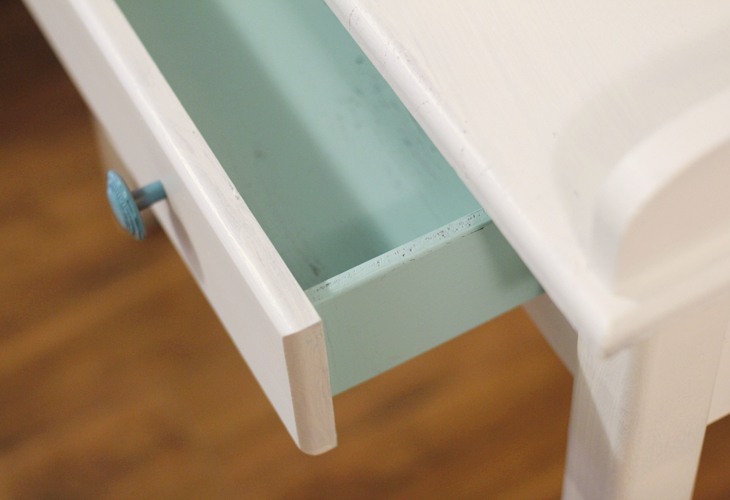 I also used this Tiffany Blue color and some Turquoise spray paint for the knobs. A few weeks ago, I bought this paint sprayer on a lightening deal from Amazon and I finally got up the guts to take it out of its box. I have so much more to share about using a paint sprayer, but for now I’ll just leave it at it works like a charm and I’m in love! Here’s what the desk looked like after one coat of paint. 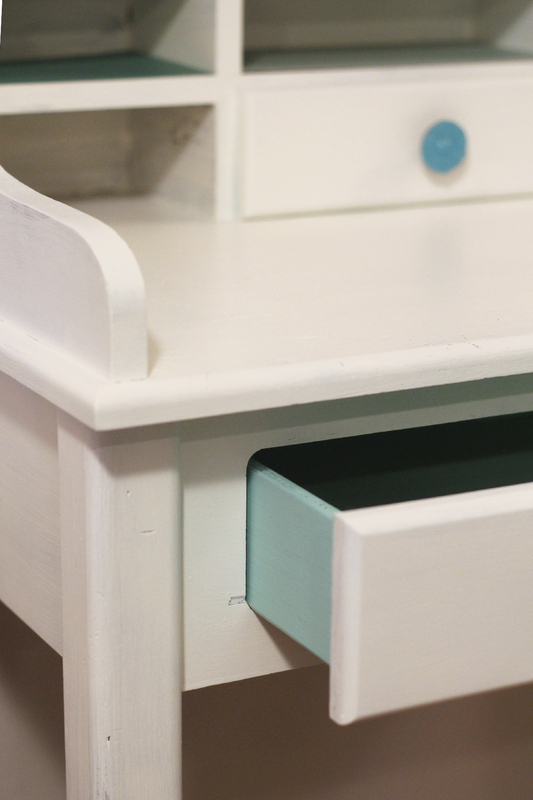 After a few more coats of paint on both the desk and drawers I spray painted the knobs a light blue color and it was almost complete. I knew it needed another pop of color so I took some of my scrapbook paper from Jen Hadfield’s new line (Tatertots & Jello) and cut it to fit inside the cubbies. It was the perfect detailed finishing look I was going for. And that was that! Another furniture makeover complete! 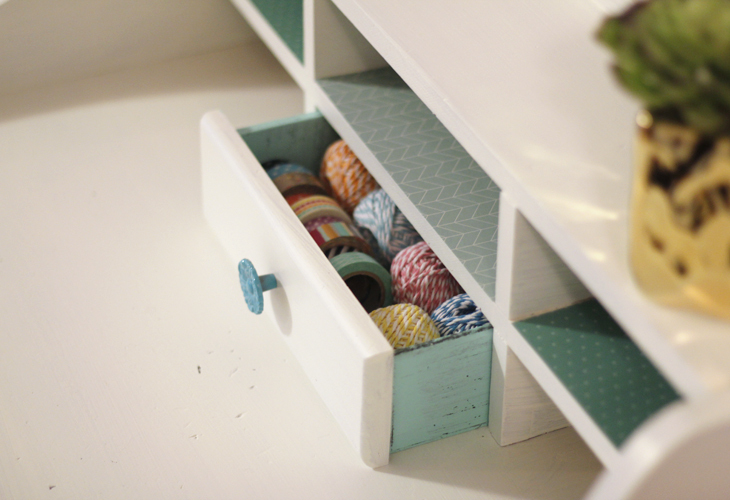 It makes the perfect craft organization desk and I’m excited to have a spot to keep all my washi tape and twine. I also love all the pops of light blue and color against the white desk. Be sure to check out the rest of this month’s contributions to #FurnitureRefresh monthly challenge. I love it! A paint sprayer is next on my list of tools I need list! Glad it worked out well for you! The splashes of color with the knobs and paper complete this project. And when you paint the draws a color…wow! Stella is a gorgeous gal!